Our venerable and God-bearing Father Alexios the Man of God (also Alexis or Alexius; Gr. Ἀλέξιος) was a fourth-century monastic who is known for his dedication to Christ in anonymity. His feast day is commemorated by the Church on March 17. Many sources will set the story of Alexis in Rome to somewhere in the tenth century, around the time when Benedict VII gave a church dedicated to St. Boniface to a group of exiled Christians, who were under the leadership of Metropolitan Sergius of Damascus. This church was renamed for Sts. Boniface and Alexis, and the relics of the Man of God were believed to be placed in this church by the West. The bones found in the thirteenth century are now not considered by the West to be those of either Boniface or Alexis. 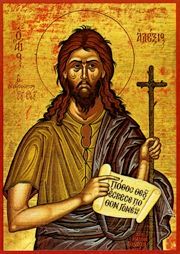 An epic poem of the eleventh century tells the legend of the saint; however, many scholars and the Eastern church believe that the Man of God lived and died in Edessa in the fifth century and the name "Alexis" is a Greek addition. He is also classed as one of the famous holy fools of Byzantium, along with Symeon the Fool-for-Christ and Andrew of Constantinople. Alexios was born in 380 AD in the eternal city of Rome during the reign of Theodosios the Great and was raised in a royal household by his parents, Euphemianus and Aglais, who discerned a predilection for the Church in their son, a religious fervour they could not share and which they sought to discourage for fear they would lose him. They lost no time in arranging for his marriage and in impressing upon him the debt he owed to his parents, for which he should respect their wishes in all things. He had reluctantly suppressed the call he felt to the Lord's service and had agreed to the marriage when he had a vision one day of St. Paul, who said he should answer the call to God at all costs, reading to him the passage in Matthew which says: "He that loveth father or mother more than me is not worthy of me." The honourable head of St. Alexios was given as a gift to the Great Lavra monastery in Mount Athos by the Byzantine emperor Emanuel Paleologos in 1398. With the blessing of Archbishop Christodoulos of Athens, the reliquary left Greece in 2005, for the first time since given to the Great Lavra monastery, and travelled to Moscow and placed at the Novospasskiy monastery for public veneration. Outside the Orthodox church, the oldest manuscripts recording the life of St. Alexius exist in four versions, from six manuscripts, and have been published by Adamant Media Corporation. The longest version, in 12-line stanzas, from Laud MS. 622, in the Bodleian. The shortest version, in couplets, from the Cotton MS., Titus A xxvi, in the British Museum. The shorter 6-line-stanza version, from the grand Vernon MS. (ab. 1400 AD) and Laud 108, both in the Bodleian. The longer 6-line-stanza version, from Laud MS. 463 in the Bodleian, and Trin. Coll. MS. Oxford 57 . Though thou didst bud forth from a renowned and notable root, and though thou didst blossom from a city famed for her great imperial dignity, yet didst thou scorn all things as corruptible and fleeting, striving to be joined to Christ thy Master for ever. Entreat Him, O Alexis most wise, fervently for our souls. and didst hasten to Christ the Master. Ever entreat Him to save our souls. As we celebrate today with fitting rev'rence the all-holy festival of Saint Alexis the all-blessed, with hymns we praise him and cry aloud: Rejoice, thou gladsome adornment of righteous men. ↑ His Holiness performed an all-night vigil with the production of the Cross and venerated the holy relics of St. Alexius, Man of God 02.04.2005 from the Church-Scientific Center, The Orthodox Encyclopaedia. St. Alexis the Man of God by Father Alexander, Holy Protection Russian Orthodox Church. "St. Alexis" in Sacred and Legendary Art, by Anna Jameson. London: Longman, Brown, Green, Longmans, & Roberts: 1857. v. 2, pp. 634-8. This page was last edited on December 2, 2013, at 05:10.